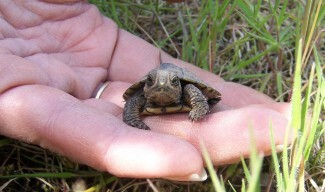 Western pond turtle hatchling in the hand – so tiny! The spring of 2006 brought exciting times to the Western pond turtle nursery at Elijah Bristow State Park southeast of Eugene. Last year, biologist Lisa Riley, whose reputation as a turtle tracker has grown along with the park’s identity as a prime breeding ground, discovered 12 nests in the park. her findings resulted from two years of trapping adult turtles and monitoring their movement in a study conducted for OPRD and the U.S. Army Corps of Engineers. Between late April and mid-May, Lisa and park staff members enjoyed the rare pleasure of seeing and photographing baby turtles emerging from several of those nests. Their appearances marked the first time Western pond turtles have been observed emerging from a nest on park property. Lisa first discovered the baby turtles, the first ones she has ever seen emerging, on April 27 while removing covers used to protect the nests from predators. “The first one I saw appeared to be lifeless, so I was worried at first,” she says. “It was alive, though, then I started seeing others emerging from other nests.” Since a baby Western pond turtle is about the size of a quarter, Lisa says they are very hard to see. “It’s easy to miss them, so there may have been others that dug their way out before we saw any,” she admits. As a bonus to seeing turtles leaving known nests, more nests were found in the well-protected open fields that serve as the park’s nurseries. The park’s backwater slough and pond system serve as the turtle’s primary habitat, but in the summer, females move from that sheltered environment to lay eggs in sparsely vegetated, sunny locations. Incubated by solar heat, the eggs hatch, but the young remain in the nests through the winter before emerging the next spring. Lisa’s two-year study of Western pond turtle populations, which have been declining in Oregon, was prompted by a need to identify nests and protect them in managing the park’s trails. Fences and signs now warn people to keep out of identified breeding areas and to stay on established trails. In her early work, Lisa used fingernail polish to draw designs on the shells of turtles she trapped, and glued radio transmitters to some as aids in searching for nests. She also has been monitoring their travels between the slough and lazily flowing Lost Creek. Lisa, who estimates that 50-65 turtles live at Elijah Bristow, is now expanding her search for nests upstream along the Middle Fork of Willamette River in adjacent Dexter State Recreation Site. Revenue from OPRD’s agricultural leases is supporting the expanded research. Check out the turtle slideshow from 2006! For more information on Western Pond Turtles visit Herpetology Northwest.